The radical Aston Martin Valkyrie has been taken to a new extreme. Built in collaboration with Red Bull, the radical . But if you thought the standard car was extreme, the track-only Valkyrie AMR Pro takes it to another level. , the Valkyrie AMR Pro made its world debut at Geneva as one of the big surprises from Aston Martin. The British firm has recalibrated the Valkyrie’s 6.5-liter, naturally aspirated V12 engine’s emission control systems and reprogrammed its Energy Recovery System. The result? This terrifying track beast has a combined output of over 1,100 horsepower, making it even more powerful than the already-extreme Valkyrie road car. Impressively, the Valkyrie’s 1:1 power-to-weight ratio has been improved, too, but Aston Martin is keeping specific performance details under wraps for now,. Meanwhile, the automaker confirmed the Valkyrie AMR Pro will still be able to hit 225 mph, even in high-downforce track configuration. It can also achieve lateral acceleration of more than 3G. It will probably do an even better job of messing up facial features than the Ariel Atom, then. Aston Martin says this figure far exceeds that of any other car derived from a fully homologated road car. The car’s incredible track performance are due to its lightweight construction and high-downforce aerodynamics. 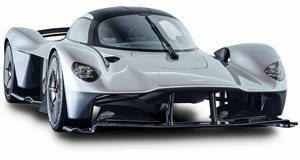 Remarkably, the Valkyrie AMR Pro only weighs 2,204 pounds, yet is capable of generating more than its own weight in downforce. To achieve this, the AMR Pro’s aerodynamic surfaces have been revised to increase downforce. The track car features a wider body, larger front and rear wing elements, a revised active aerodynamic control “strategy” and lighter construction of carbon fiber. Weight is further reduced by the removal of unnecessary items, such as the heater/de-mister blower and infotainment screens fitted to the road car. New ultra-lightweight track-specific components have also been fitted, such as a polycarbonate windshield and side windows, carbon fiber suspension wishbones, moulded race seats and a lighter exhaust system. “Seeing the Valkyrie AMR Pro and this year’s Aston Martin Red Bull Racing F1TM show car together at Geneva is a special moment for me,” said Adrian Newey, Chief Technical Officer at Red Bull Racing. “The Aston Martin Valkyrie road car draws extensively from the knowledge I have gained during my career in Formula One, but the AMR Pro version has allowed me to work beyond the constraints of road legality, or indeed practicality! We’ve told a few of its secrets, but by no means all. I will leave it to the public to ponder the lap time predictions. Suffice to say they’re quite impressive.” As part of a trio of track thoroughbreds on display by Aston Martin, the Valkyrie AMR Pro is currently being showcased alongside the 2018 Aston Martin Red Bull Racing F1TM show car and Aston Martin Racing’s new Vantage GTE World Endurance Championship. Only 25 Valkyrie AMR Pros are being built, with custom deliveries starting in 2020. Every example has already been sold.